Vehicle entertainment system with shiny housing, 3D screen, and mounted on the back of the seat. A remote smart device can control and monitor the vehicle's status. An OS based master monitor has a media player and is connected to at least one slave monitor. The master monitor is controlled by a smart device. Personal information and preferences can be stored in a smart card. When user boards the vehicle, the user tags the smart card to the master unit, and the master unit can play matching content on slave monitor for the user to enjoy. The vehicle entertainment monitor can be controlled by user gestures, remote control, or voice. The image from a rear facing camera can be displayed on the windshield or on a head unit. Two vehicle entertainment monitors are connected wirelessly or by wire. They are connected to the vehicle power source through a power filter, not the conventional control module. These two monitors can either share content by wire or wirelessly. The invention uses the backlight of a roof-mounted monitor as a light source to replace dome light lamp in a vehicle. Therefore, the roof-mounted monitor plays AV content and doubles as the dome light. A vehicle monitoring system, comprising: at least a sensor; a head unit; at least a smart unit; wherein the sensor is capable of detecting vehicle status, generating a corresponding signal and then sending the generated signal to the head unit; the head unit is capable of receiving and analyzing the generated signal, and generating an analysis result, and then informing whether the vehicle status is abnormal by outputting a warning in the vehicle or sending the analysis result to the smart unit; the smart unit is authorized by the head unit and capable of displaying the analysis result. Granted by Japan patent office. 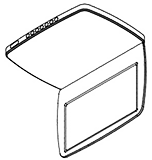 A design patent application for a roof-mounted monitor with a flat base and a single rail so that the display screen can slide back and forth. A design patent application for a roof-mounted monitor with a flat base and two rails so that the display screen can slide back and forth. A vehicle media system for a seat of a vehicle is disclosed. The system includes a media unit mounted to a support structure within a headrest, a video monitor supported within the media unit, and a media source device coupled to the support structure at a horizontal angle with respect to the media unit to permit front loading access of the media source device by a vehicle occupant.